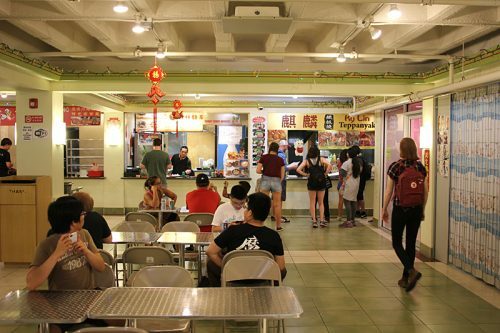 THE RICHLAND FOOD COURT IN CHINATOWN WAS humming that Saturday, full of Asian college students (or even high school ones—there is, after all, the city’s headquarters for K-Pop upstairs) and more than a few non-Asians trying to make sense of a food court where businesses sometimes don’t even have names in English. I was standing in line at one of the new spots, and a white couple, a bit large on the hoof (the three of us could have taken the whole room of scrawny Asian kids), searched a laminated menu for something to eat. I tried to make the universal signal for “I know what I want already, let me go ahead of them” with my eyes, but it wasn’t getting through to the man behind the counter. Finally the couple looked up at him. 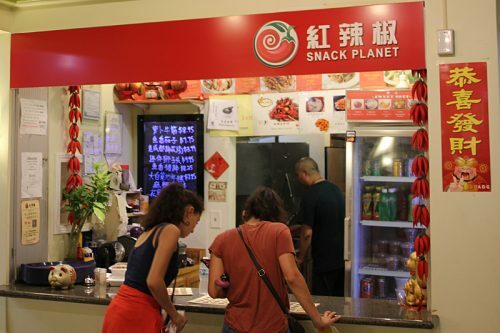 “Orange chicken?” they asked hopefully, naming something available in the kind of food court where your other choices including pizze di Sbarro and The Great Steak & Potato Company. “No orange chicken,” the man behind the counter said implacably, disappearing into the back of his stall. So this is the state of the Richland Food Court a year after I did the first stall by stall survey: it’s becoming better and better known to the city as a unique resource, a two-way immigrant gateway to American prosperity (for them) and Chinese food authenticity (for us). So people are checking it out, and not just the Asian kids (obviously its most natural audience). But if non-Chinese come here and they don’t have some intel on their side, they’re going to find it a frustrating experience. So here’s the guide again, revised to reflect the state of the food court as it exists in summer 2017, working clockwise from the first stall on the left. 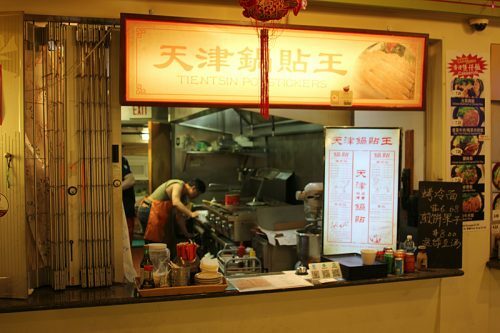 To sum up the changes, two stalls in last year’s guide are now gone—one, sadly, is Tong’s, home of the awesome jiangbing (good news: according to Friend of Fooditor Kenny Zuckerberg, you can now get a very good jiangbing at the Michigan Avenue Lao Sze Chuan). The other, the soup stand Yummy Yummy Noodles, has graduated to a full restaurant at 24th and Wentworth. 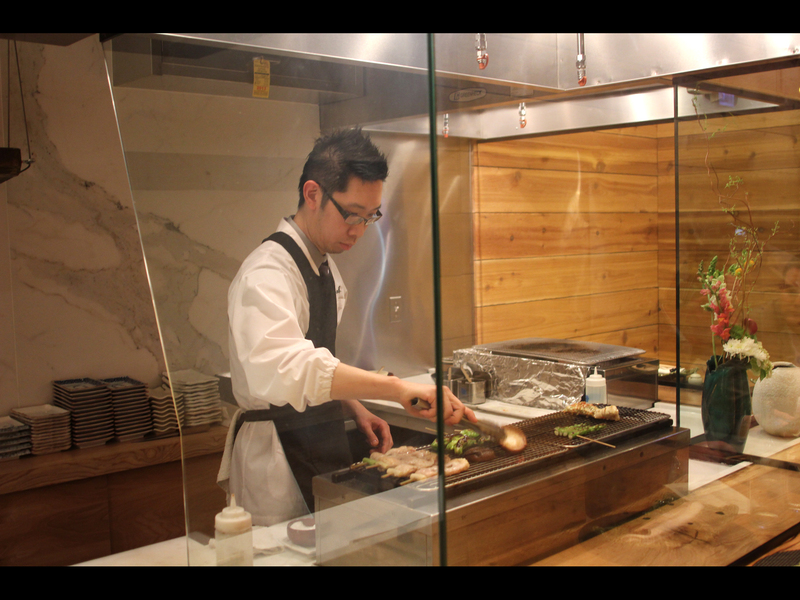 Instead there are three new stalls, all of them worth checking out. The first stall on the left as you enter does not even have an English name; what it has is a big golden fish in a glass case, so my sons referred to it as “the golden fish place,” which will have to do. The menu seems to have something of everything—marinated squid, chicken feet with pickled peppers, tofu hotpot, an assortment of grilled skewers, and various dumplings, one type of which was sitting on the counter. I ordered the packet of four dumplings that were sitting out; they went straight into the microwave. (On a later weekend visit, they had braised ham hocks sitting out on the counter.) I tried to order lamb skewers, but they didn’t have them for lunch, it seemed, so instead I ordered a chicken wing skewer. If this place does have a specialty it excels at, I couldn’t spot it, but what I tried was pretty good. The dumpling proved to be the simplest kind—just a meatball inside—but dipped in the ginger soy sauce (lesson number one of these places: ignore the generic packets of soy sauce that come with the food, and make yourself a bowl of the various sauces and oils they have sitting out on the counter), it was quite tasty, with a fairly lightly-made wrapper. 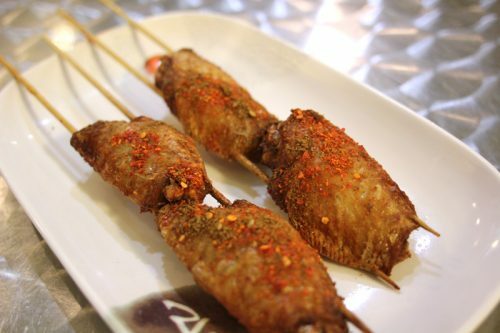 The chicken wings could have come from a Tyson freezer bag for all I know, but fried and dusted with the togarashi-like pepper blend that all these places use, they were excellent—plus, with the skewers running through them, I was able to tell my sons they were fried bats. 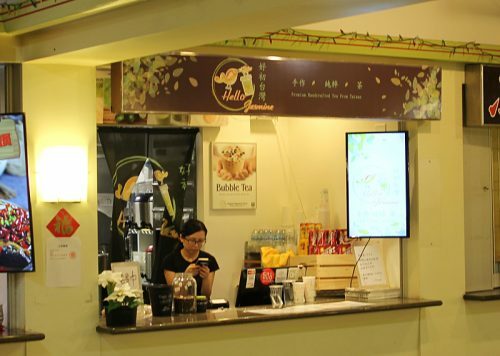 The food court has lacked a youth-oriented snack shop since the departure of (no great loss) Grill’N’Chill Cafe, so the arrival of this Taiwanese bubble tea shop with a short list of snacks fills an obvious niche—though don’t expect fruity bubble drinks; they’re serious about everything being a tea-focused drink, with maybe another flavoring worked in. 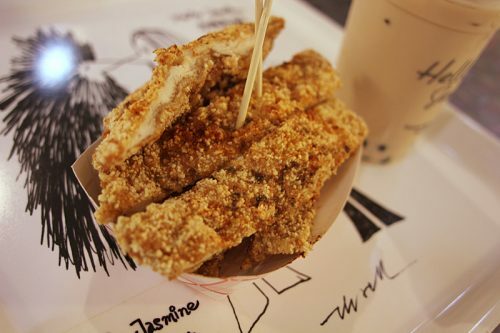 Food wise, Yelp reviews make it pretty clear what snack you want: Taiwanese fried chicken strips. Imagine a fried chicken patty coated in Asian seasonings and sliced into ribbons of chicken. I CAN’T HEAR YOU! 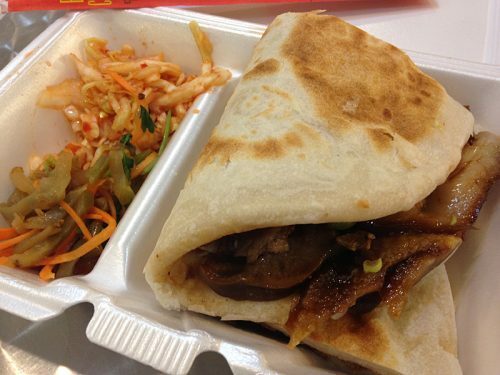 Imagine a totally awesome, delectable strip of chicken fried to crispy crunchy perfection that tastes like Chinese food. I STILL CAN’T HEAR YOU! Did you go wait in line at Jollibee, only to find that… it was fine, but not that great? This is that great. The sign for Town Kitchen is over a metal gate that always seems to be closed; you have to realize that the stall next to it is Town Kitchen as well. 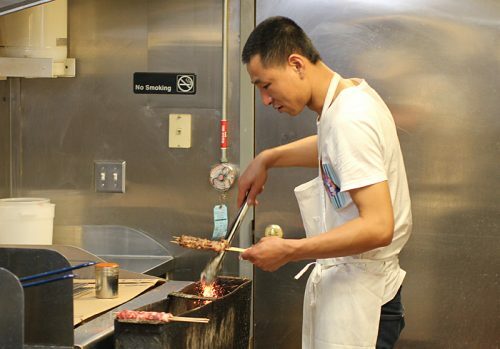 In any case, this is the place to get lamb skewers these days—not least because before they closed off that side, you could see the guy standing over the narrow charcoal grill on which the sticks would be laid. I ordered a set of four (the minimum) and then looked over the rest of the menu, and figured something called “vegetable pancake” would probably represent everyday food for the people of the region where the town in the title comes from. 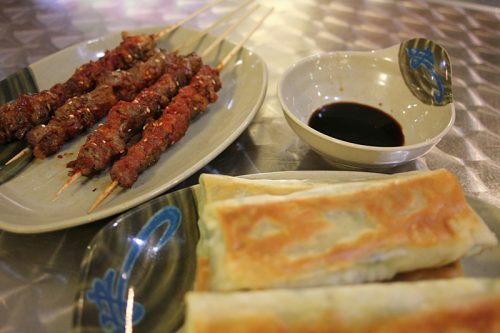 The lamb skewers were as perfect as long-gone food court resident Lao Pi’s—juicy grilled lamb with the togarashi spice. Good to know that’s still represented among the offerings. The vegetable pancakes turned out to have a brittle shell of a wrapper, filled with what looked like one of those Asian mystery greens that always gets called “water spinach,” plus egg and cellophane noodles. I liked them quite a bit, though the soy sauce they sent out was way too salty for them (generally the case down here, frankly) and I wound up dipping them in another stall’s ginger-soy sauce instead. 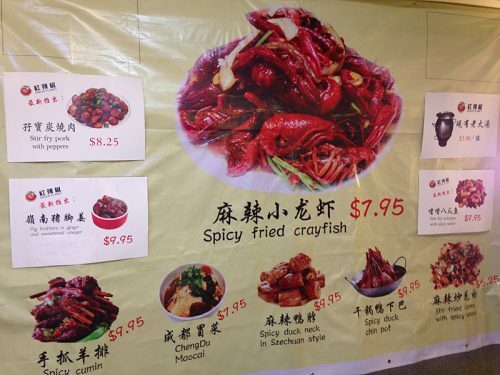 Recently this stall put up a long picture menu that includes some other enticing items (smoked rabbit, anyone?) 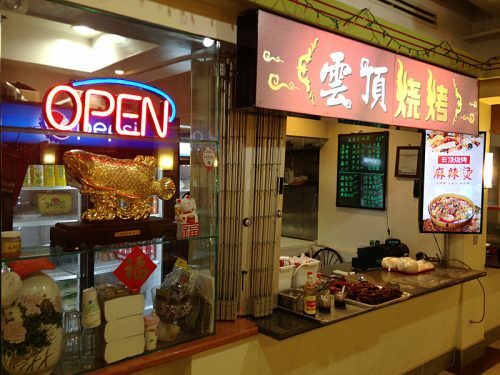 as well as a lot of familiar things like Kung Pao Chicken or General Tso’s Chicken, making it easy to pick by looks. Well, unless you want Orange Chicken. 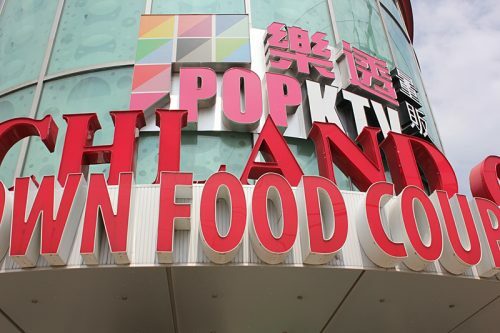 Tientsin Restaurant was the first one I went to which made clear where its owners are from—Tientsin, more commonly called Tianjin, a major port and industrial center whose name you may have seen on containers and rail cars. I went straight to the section of the menu labeled “Tientsin Special” and ordered an onion pancake. I got a circle of fried dough, served with two kinds of preserved vegetables. 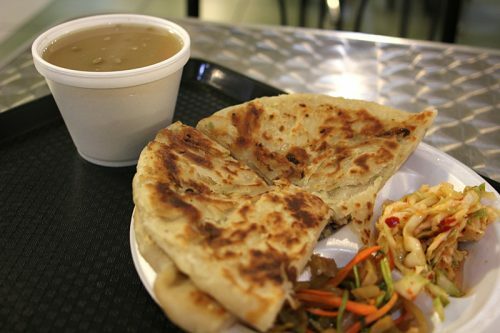 One was too salty, but the other, sweet with rice vinegar, made a great topping for the starchy pancake, much like the pickled-cabbage curtido you put on a Salvadoran pupusa. Simple as could be, but this was one of my favorite bites. It came with a bowl of brown-gray congee, which I could have doctored to flavorfulness, but didn’t. Talking about it with my friend Rob Gardner, he mentioned that he had tried something like “pig face pancake,” so I checked the menu for that and found “Pork Head Meat Pancake,” which indeed fit the bill as rubbery pig face in a pancake with hoisin sauce. Stuffing my pig face with the vinegary slaw, this too was a fantastic bite. Still, I felt I should branch out on the menu, and on another visit I sensed a new employee (I found out it was her first day) had better English than the owners, so I asked her for some guidance on the menu. 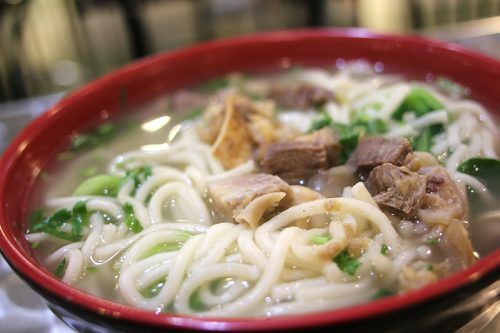 I think what I got was more like the safe choice for gringos than the most interesting choice, but I wound up with a nice looking bowl of beef noodle soup—that is, a little beef in chicken broth with thick udon-like noodles and a few greens. I liked this quite a bit, with its hearty, cloudy chicken flavor; just be warned that one son and I both dug into it substantially, and we hardly seemed to make a dent in it. So if you’re there to try a lot of things, this is definitely meal-in-a-bowl-sized by itself. 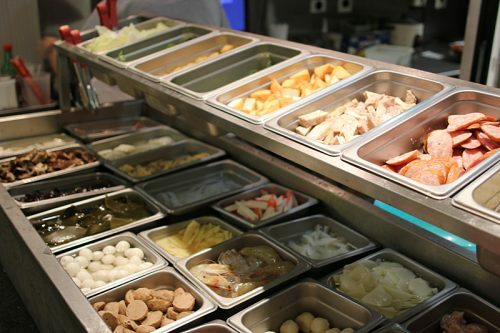 “Xinglong Foods” is what it says on the receipt; there’s no English on the sign, but it’s easy enough to recognize by the buffet line of raw meats, vegetables, tofu and other Asian ingredients, which you select yourself (minimum one pound). 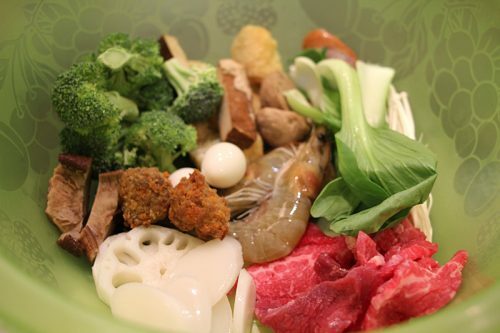 Seeing people piling this stuff into a plastic basket, I figured this had to be a sort of hot pot place, that being a hot trend in Chinatown right now—though they obviously don’t have the tables with heating elements in the middle that hot pot places do. Still, I was fully expecting a steaming bowl of hot liquid with lots of tastes floating in it. Well, the $15 dish I wound up with is called “spicy hot pot,” but it’s not exactly the soup I was expecting. 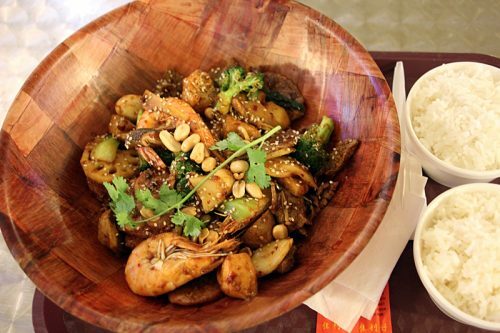 Instead it’s a bowl of stuff stir-fried with a spicy sauce which is heavy on the metallic taste of Szechuan peppercorn. Really heavy, like eating a box of aluminum foil heavy. If you like that effect, it’s a very tasty bowl of stuff, though it’s big enough for at least two people, maybe more. The stir-fry dish was lamb with onions and peppers in soy sauce—a very solid rendition, if not terribly unusual. More interesting was the cold chicken dish next to it. 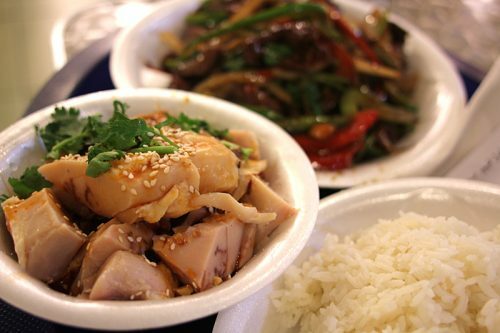 Nanshan chicken is poached white meat—this felt silky enough to be sous vide—served cold in an oily sauce spiced with Szechuan peppercorn, as the telltale tingle around the lips soon revealed. This is a delicate, sophisticated dish that made me think of fine dining versions of chicken like the $75 sous vide chicken at NoMI or the chicken salad portion of the $55 chicken entree at the Roister—though it’s rather more of a deal than those, at $3.95. 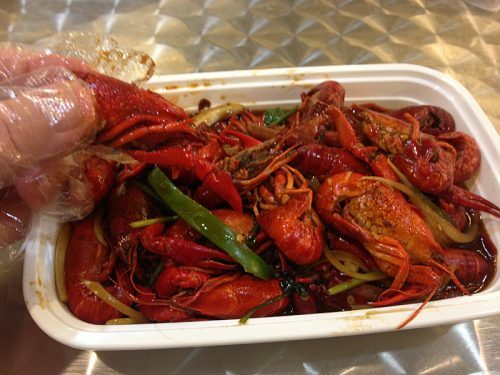 I ordered a tub of crawfish, and they were pretty decent (I find the spices almost always a bit one-dimensional at these places, except for the great Saigon Bistro) and, at $7.95, the price was right. 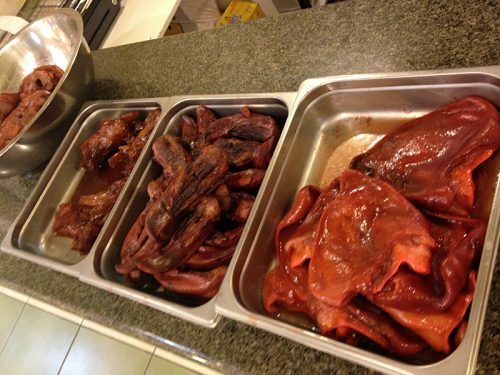 This continues to be a thing, although I noticed that some of the dishes have since changed—a spicy duck and a spicy pork dish looked to be new, and worth a try sometime. 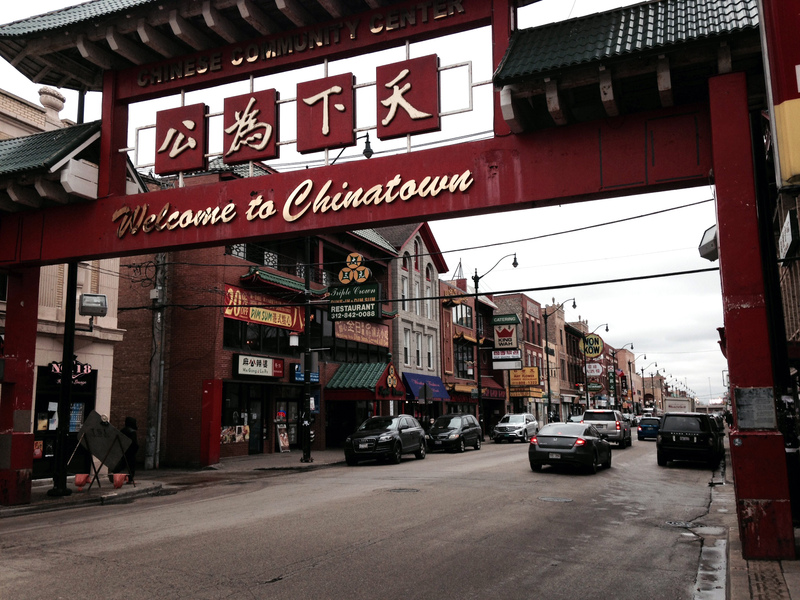 Which raises the question—if you’re here to eat authentic Chinese food, should you waste stomach space eating some other cuisine that’s here for Chinese people who want a break from Chinese food? As of last year, I had never tried the sushi, but recently my younger son, who loves salmon nigiri, decided to give it a try. 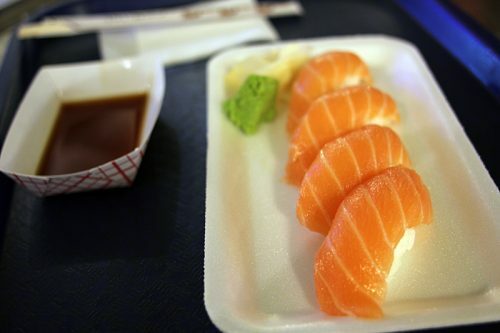 And I have to say, for $1.50 salmon nigiri, it’s pretty good. 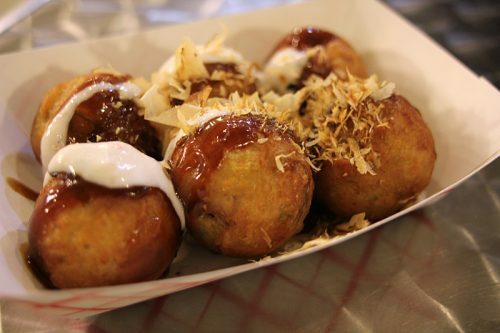 The takoyaki, octopus-filled fritters topped with mayo and takoyaki sauce (which is kind of like BBQ sauce) and fishy bonito shavings, are pretty decent. 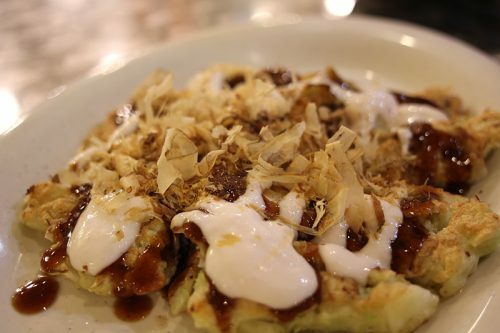 The okonomiyaki, a kind of seafood and vegetable pancake likewise drizzled with mayo and a sweet sauce, is quite good. This isn’t the only place in town you can find either one, but they’re not that common, either. Beyond those two items, the Japanese dishes are pretty run of the mill—beef udon was pretty weakly flavored, and a bowl of beef teriyaki with rice was fine but nothing you couldn’t find in plenty of other food courts where the competition would be Sbarro’s, not Snack Planet. NOTE: Ky Lin is closed for vacation into August, according to a sign posted on the metal screen. This stall is frankly something of a mystery. 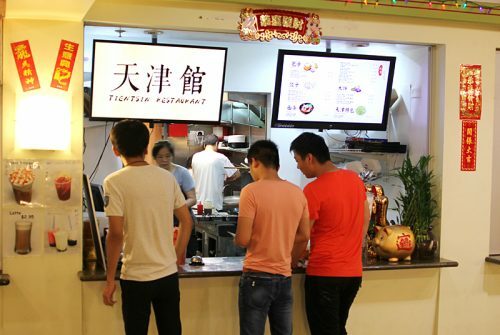 It has a printed menu—an actual takeaway menu—containing 136 numbered offerings, ranging from stir-fry dishes to dry wok dishes to broiled fish dishes. Yet when I walked up and tried pointing to a couple of items. I was told they didn’t have them. Instead, the guy working the counter finally just said, “Here’s what we have.” He went back in the kitchen and came back with a large bowl full of ham hocks. 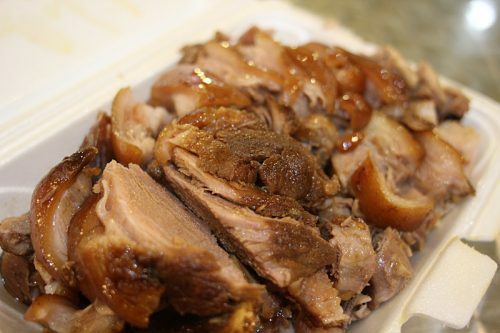 And for $10, I got a freshly-braised ham hock, giving off wafts of pork and star anise, neatly chopped by hand and coated with a spicy-sweet sauce. It was pretty good, though obviously a bit impractical as a lunch. I thought maybe he was just doing prep during lunchtime, so I made a visit at dinnertime. I picked up the menu, tried to order one of the noodle dishes off of it—and he pointed me to an English list of braised meats. 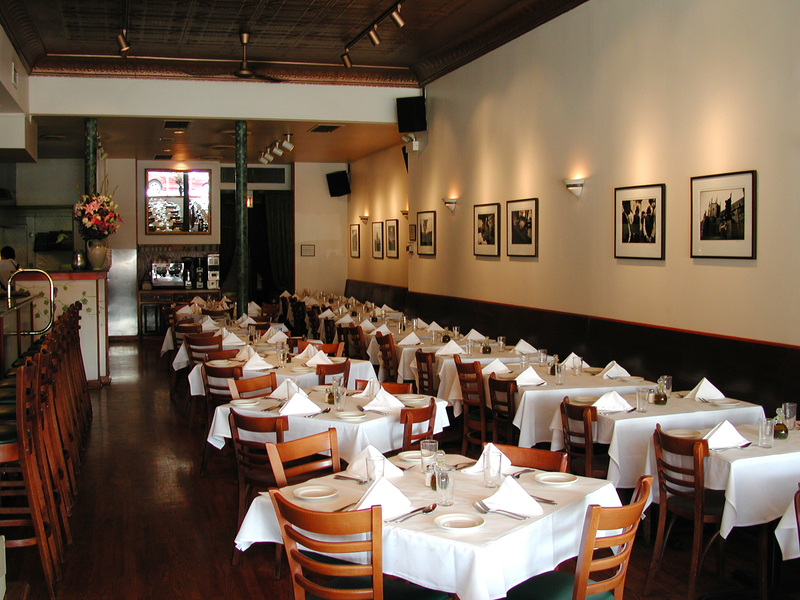 So far as I can tell, that’s all they serve now… but they still have the old menus sitting out, to confuse people. Anyway, that evening, besides the pork hocks, they had duck heads, duck necks and pig ears, so if you need Chinese meats for your feast, this is the stall. As you might expect, this is an offshoot of Tientsin Kitchen—a fact confirmed for me by the young man working it, who explained that one of them is his mom’s restaurant, the other his aunt’s. They have an English menu, but honestly you could just about guess your choices here: pork potstickers (pork with celery, pork with chive, etc. 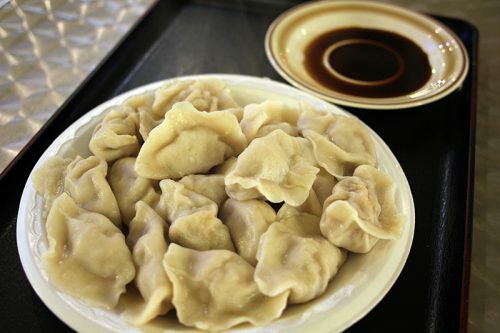 ), lamb potstickers, and so on. 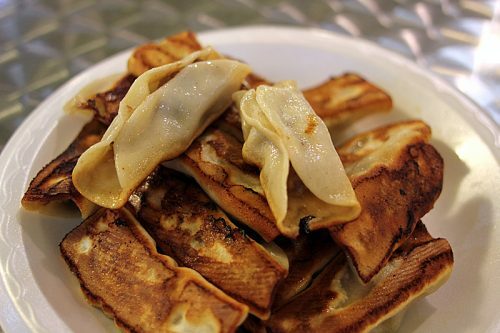 What’s unusual is how the potstickers come out—instead of being sealed dumplings, they consist of a little log of meat inside a disc of wrapper, which isn’t closed—so they have to cook them all the way through on the grill, I guess, which accounted for the fact that these seemed to take a very long time. On a second visit I looked the menu over again and noticed that it also said “soup dumplings,” with no clue beyond that what the offerings were precisely. I asked the same guy if that meant they were xiao long bao, and he said no, xiao long bao are steamed and these are boiled. The only flavor choice was pork and cabbage. They may not be precisely xiao long bao (and they certainly don’t photograph as prettily), but they’re awfully close in flavor, and very good. 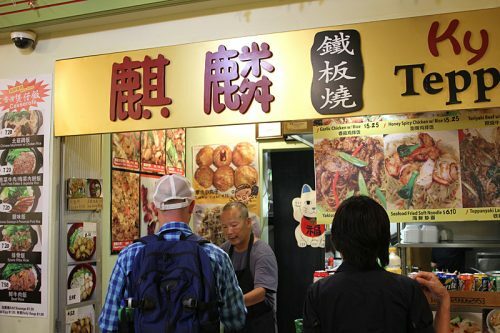 The choices here may be fairly slim, but you won’t be sorry ordering either potstickers or soup dumplings to go with what you get from other stalls. 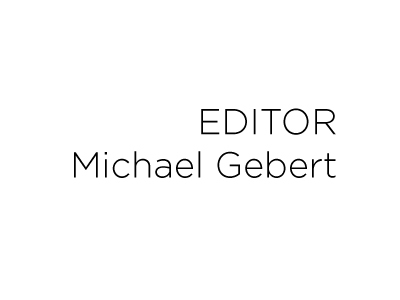 Michael Gebert considers Fooditor a basement food court of the mind.